Hi All! It's CODY!! I know you are glad to hear from ME! Now that the New Year is approaching many of my kitty friends are starting to reflect on their plans, hopes, dreams, favorite mode of destruction and more slick ways for us to think about getting what we want out of life. I am here to help ya out! 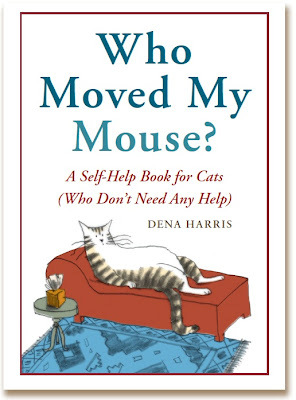 I noticed that this book is "A self-help book for cats (who don't need any help)"...well...that would be ME! This is purrfect! Everyone else is making New Years resolutions and reading self-help books, but not MOI!! I am purrfect just the way I am! I knew I had to pawsitively read this book! 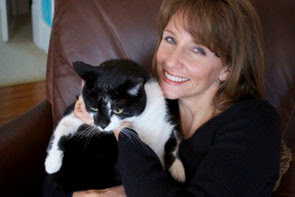 Dena and one of her cats "Olivia"
This book is full of fun pawsonality profile quizzes, quotes, exercises (don't get nervous my kitty pals, not the kind that actually makes you get up off of your comfortable perch), tips and lots and lots of laughs! They say it "empowers cats to make the twenty minutes they're awake each day the best twenty minutes of their lives" "Twenty minutes??" Noooo way, it is actually TWENTY FIVE minutes! Ok, move closer to the screen my furriends and let me tease you with a little nip of what you will find in this fun and informative book! A Cat's Conversations with God, kitties ask questions to God and God answers them, here is an example: CAT: "Then why does "DOG" spelled backward equal "God"? GOD'S REPLY: "that was an oversight on my part. Horrible mistake. Lots of confusion resulting from that one-I'm still trying to sort it out. My apologies." "Don't Sweat the Small Stuff...But Feel Free to Freak Out Over Anything That Moves Suddenly or Without Warning. Purrspective:Will This Matter a Year from Now? There are sooo many valuable tips/hints/tricks in this book that kitties you will be set for all of your nine lives! !I have so many things that I love about this book that my scent is just marked all over the place! It was hard for me to pick the ones for your pawview that I liked the best. Let me leave you with my pawsonal fave from the section "How to Avoid Being Punished for Anything, Ever"
Dena and one of her cats "Lucy"
"INVOLVE THE DOG-This ploy is so easy it's almost cruel. Lead the puppy to the (fill in the blank----broken dish, tilled plant, chewed shoe, crashed computer) and invite him to play. Wipe any incriminating cat paw prints from the scene with your tail and assume the "I'm as shocked by this behavior as you are" look when your human enters the room and sees Scout happily rolling in plant dirt." Come closer kitties, let me whisper in your ear, like the best-selling book The Secret....we kitties have one too! But....you'll have to pawchase the book to find out what it is! ABOUT THE AUTHOR: Dena Harris has been a humor columnist for Cats & Kittens Magazine and contributor to Chicken Soup for the Cat-Lover’s Soul . 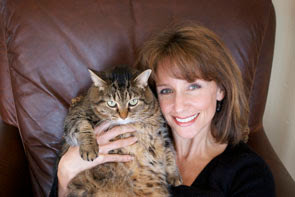 The author of Lessons in Stalking and For the Love of Cats, Dena lives in Madison, North Carolina with her husband and two cats in a home filled with expensive, never played with cat toys. information on the book and author, visit www.selfhelpforcats.com. You may also purchase Who Moved My Mouse? at amazon.com, Barnes & Noble, Borders, Indiebound and Powell's Books. This sounds like a fun book! I have to add this to my shopping list. Thanks for the review, Caren! @Priscilla it is sooo humorous and interesting! I know what you mean about the "big pile" I have a STACK of magazines that I subscribe to on the dining room table (good place for them huh? lol) and many date back to SUMMER that I haven't touched. I will tackle them one of these days. Also have a few more books to read as well. Glad you enjoyed the review but it was Cody who did it! We came by to answer your questions about the Fling-ama-string. It is not real noisy. It does make some noise, but nothing too bad or annoying. (Our mom hates noisy toys!) It hooks onto the doorknob and then there's an elastic strap that hooks onto the doorknob on the other side so it would be really hard for it to come off the door. We haven't knocked it off...yet! Heehee! The string is attached pretty good and is sturdy. We have heard that some cats chewed the string off of it. We've bit the string but we haven't chewed it. They do recommend human supervision when we play with it. And when we're not playing with it, you're supposed to wind the string up around the doorknob so we can't get to it. The only "complaint" that we would have is that it kinda bangs on the door when we play with it. There are rubber things on the back to keep it from marking the door but we wish it was a little more stationary. Our mom might try to attach it to the door somehow to keep it from knocking around. So far, we're having a lotta fun with it. And we think it is a pretty good toy and Cody would like it. @Whiskeratti and @Hilary the book is great and A LOT of fun! @Wally and Ernie, thanks pals for coming over to give me the low down on the Fling-a-ma-string! I am gonna have my Mom check it out. I am a HUGE chewer (of things that I shouldn't chew) so I am super happy to know if my mom wraps it around the doorknob that we should be ok.
My Mom doesn't like noisy toys either so she was very happy to hear that this isn't too noisy! Sounds great fun, like the bit about staring into a strangers eyes! LOL! Hi Caren and friends and thanks for the great review of the book! I had a lot of fun writing it (with the help of my two cats, Lucy & Olivia) and I really appreciate your enthusiasm for the book. I've got book plates I can sign and mail (free!) to anyone who'd like one for their book. Just shoot me an e-mail at ddharris@triad.rr.com. @Dena thanks much for stopping by and reading the review! I am so happy that you enjoyed it! I can tell you had a blast writing it...that was one of the other things I loved about the book, you can tell you truly love cats, understand them and enjoyed writing the book. Thanks so much for your offer of FREE BOOK PLATES for anyone who purchases the book! Thanks for this great review! We have commanded Mommy to purchase it for us. OOh, I'll have to budget for this book. We just adopted 2 kittens from the local animal shelter after 2 of our lovies passed way (1 after 20 years of cuteness). I'm working on a book too (for about 10 years) about cats. But, first I'm going to enjoy my kittens. Every time, you review the book. My mom just gone crazy !!!! Finally!! Move Over cheese! This one sounds great! My sister will love this book!! A great birthday gift...thanks! @Katnip Lounge YAY! I am so happy to read that! Did you see that Dena (the author) is offering FREE book plates to everyone who purchases a book? See her email address on her comment! I know you will LOVE the book! @Old Kitty, you know how I LOVE to make you and Charlie laugh! That makes my day! Oh yesss be sure to have this at the top of your list! @Diane I love it! "move over cheese!" lol!!! You will love this! @Art and Sew Forth it IS a great and unique birthday gift for a cat lover! Your sister will love it! That sounds like a swell book. Hey...but don't you go around chasing after mice, OK? purrrr.....meow! Hey this looks like fun! Will put it on my list. I'm going to look for this one. I LOVE books written by Cats. This one sounds hilarious. @Oskar, it most definitely is! @Alittlesprite I posted above all of the ways you can get the book, will any of them work for you? Nope! No section for staying out of the rain MOL. I think Moby just likes to get wet...it makes the hunt that much better! Sounds like a great book - thanks for letting us know about it. Hope your Christmas was fun. I am a new visitor and follower from Friday Follow! @cats of wildcat woods it is a super fun book, you will love it! My Christmas was fun and I hope yours was too! Hi Tucker! What a thoughtful doggie you are telling your "cat kids!! "....ohhhh there are a number of things in there about doggies so you might be pretty busy tearing!!! BOL!! Hi Doreen Thanks much! Sometimes Cody does pretty well, I think I'll keep him! lol. Ohhh you don't have a kitty? Let me know if you do adopt one, that would be fantastic! @Fin I would LOVE to read/review your book! From what I have read of your writing and about your book online I am certain I would like it! If you are serious email me at cgittleman at mi dot rr dot com and I will give you my address! It would be my pleasure! OO! We have Borders over here! I'm gonna check it out! Mommy was soo excited - SHE read this review out loud!!! Me MUST have this book! Thank yous for writing about it Caren and we thinks we will get the bookplates too! @Alittlesprite let me know if you get it and how you liked it and don't forget the free book plate from the author!! @The Cat From Hell-thank you!! That makes me so happy! You will greatly love the book I am sure! The bookplate is free and Dena's email address to get one is in her email address listed in her comment above. Thanks for the headsup this book looks great.